Replenishment report shows which and how many products need to be purchased. For each product you will also find the estimation of potential lost revenue if you don’t purchase it on time. Before using the report you should configure lead times and days of stock for your products. The lead time is the amount of time between placing a purchase order and receiving products. The days of stock (stock cover) is the period of time for which you’d like to have enough stock. You can set it individually for each SKU by clicking in the field for lead time or days of stock and typing a new entry. 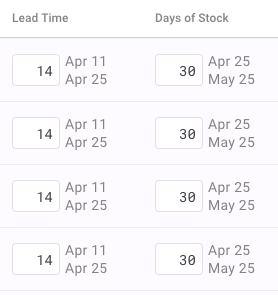 You can change the lead time and days of stock for all products at once using the “bulk actions” menu. Or set it by supplier and warehouse and it will be applied to all its products. To do this, go to Vendors from the left side menu, then click on a vendor name. Inventory Planner also will also compute replenish date, the last date when you can purchase without going out-of-stock and missing potential sales. When the replenish date is today, the variant is alerted and you will be missing some sales if you don't purchase it today. you will see details related to sales forecasting, such as product sales by the month, average sales, and the forecasted stock information explaining why we suggest that you purchase that amount of units. The forecast and number of units to purchase are two different numbers. The forecast indicates how many units you will sell in the review period. The replenishment number indicates how many products you need to purchase to satisfy this demand. 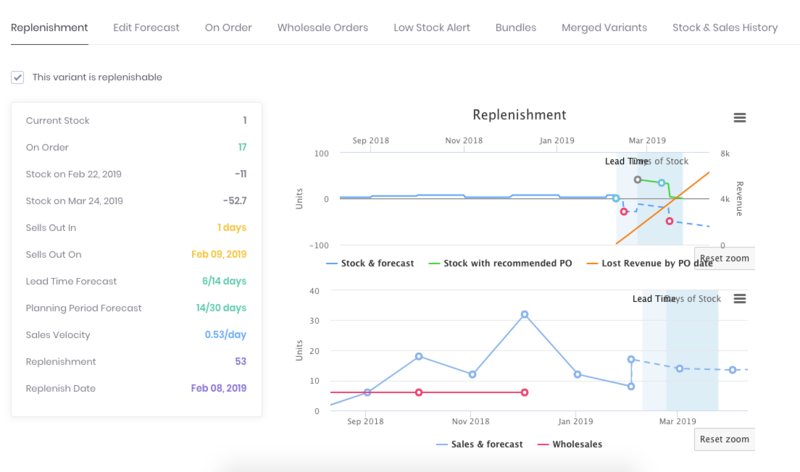 Replenishment depends on the forecast, your current stock level, number of units you will sell during the lead time period, and the number of products on order. In detailed view you can also tag products as seasonal. In this case the forecasting algorithm will take into account sales 12 months back and adjust the forecast accordingly. Another important aspect for the forecasting is product stockouts. For example if you sold 10 units of product A last month and half a month the product was out of stock, the real demand for this product is 20 units per month. Inventory Planner tracks stock levels for each product from the moment of installation and knows when the product is out of stock. You can manually mark days out of stock for time before installation. This information will be taken into account by the forecasting algorithm, but sometimes you might want to deactivate it. You should deactivate it especially when you allow backorders. In this case if you sell 10 products a month and it’s out of stock in half a month, the real product demand is still 10. To view or adjust stockout information, click on Details -> Edit Forecast. If you don’t want to see some particular products mark them as non-replenishable and they will disappear from the report. If you want to view or make them replenishable again, you can adjust the filter on the top. By default you see the replenishment report for your variants (sometimes called simple or sellable products). It can be a tee-shirt with a particular color and size. You can also see the aggregated report for products, categories, or vendors. As we mentioned before, the sales forecast is based on the history of sales of each product. You can set the date range for sales taken into consideration when calculating the forecast and metrics such as sales velocity. The date range for the Replenishment Report is found in the upper right corner. For example sometimes you’d like to take into account only the most recent months of sales or some period in the past and ignore all other months. When you change it, you will not see the new forecasting right away, as it takes time to recompute. Click the recompute button and wait until the “recomputing replenishment” message disappears. You can also increase the forecast by a fixed number or a percentage when you know in advance that you will sell more than usual. This can be useful, for example when you plan a marketing campaign. In order to do it click on Bulk Actions -> Increase forecast by a percentage.